Robotic Innovations, the South African based robot welding and systems integration specialist, has recently installed two welding robot cells for manufacturing a South African-designed mine detection vehicle. African Fusion talks to Altus Mostert about the special features of the systems. The South African-designed and manufactured mine detection vehicle that can detect mines while travelling at 25 km/h. (Image from: img.blog.yahoo.co.kr/ybi/1/24/56/shinecommerc). The vehicle is designed to withstand a mine detonation. The front and rear wheel modules can be blown off without destroying the vehicle or causing harm. A trailer travelling behind the vehicle carries spares, enabling a damaged module to be quickly replaced. Robotic innovations has installed two new robot cells into the manufacturer’s workshop space in a newly painted area surrounded by red safety curtains – each with four workstations. “Initially we concentrated on automating the welding of six items: the hull, the cab, the front and rear wheel modules, and the grills, but the company now sees a whole lot more that can be welded using this system,” says Mostert. “It needs to make more wheel modules than any other part, so two of the workstations were dedicated to these,” he adds. A wheel module component being welded at the front-end workstation. 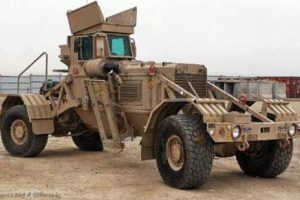 Each vehicle is delivered with three front and three rear wheel modules, and additional spares are also ordered should any be lost in service. He shows us a component of the front-end wheel module set up ready for welding. The component is first tack welded in its purpose-built jig. The whole jig and component is then lifted and mounted on a single axis manipulator, between a head and tail stock. “The six axis welding robot travels on a linear rail to access each of the four workstations. 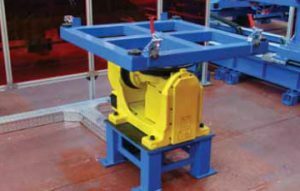 Each cell consists of two single axis manipulators on each side – one for welding the front-ends and the other for welding the rear-ends – specified to take 500 kg between the head and the tailstock, “but they can cope with up to eight tons,” claims Mostert. 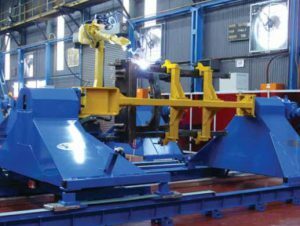 The six-axis welding robot travels on a linear rail to access each of the four workstations. He points out the design of the trunking. “If people stand on trunking, it can break, so the trunking sits under special beds that people can safely stand on.” The linear rail is also protected. As the robot runs up and down, a system of pulleys picks up the rail on one side and puts it down on the other. Fanuc M-710iC robots have been chosen for the cell running with a Siemens S7-300 PLC controller. Lincoln 455 welding power sources are integrated into the software of each welding cell, allowing the robot and the power source to be programmed using the same interface. “All the parts are made of Armox, and armour-plated steel imported from Switzerland. It has to be welded with stainless steel MIG wire,” says Mostert. 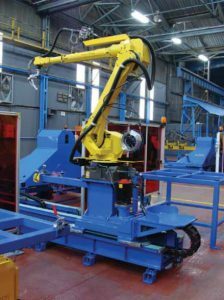 “We are using a 1,2 mm Lincoln 307 wire and a Binzel A500 robotic torch.” The manipulators, made in Port Elizabeth, use Fanuc motors with zero backlash so that it can be accurately rotated and controlled. The tailstock can also move up and down to handle a variety of different jig sizes. The two robot systems also feature: red perspex safety screens; safety lighting; automatic part detection; automatic torch cleaning and recovery; and two different types of seam tracking, laser seam tracking and touch sensing. A two-axis manipulator installed in order to improve access to some of the more complex components and to achieve as much flexibility as possible. Currently, the manufacturer’s welding team is systematically programming parts one by one using a simulation package. Jigging is also being designed for more and more of the vehicle’ components. “We are introducing a lot of smaller jigs so that we can use the robots more,” says Mostert. “We have chosen a top-down approach and allowed for add-ons. Eventually, the two robots will be able to do almost all of the welding. Because the systems are floor mounted, we can add more manipulators and extend the rails so that the robots can travel deeper into the workshop,” he tells African Fusion. The future? “A second generation unit is currently being developed – a twin cab unit – and the market for these vehicles is still expanding,” responds Mostert. This is a Proudly South African product that is being manufactured in South Africa with locally designed robot systems. “Nobody else in this market is in the same league as us,” he concludes.